It’s a cool crisp fall morning and the sun has just shone it’s beautiful warm face over the horizon. It’s rays glitter off of the icy design that Jack Frost gracefully painted upon the trees, grass and plants of Mother Earth. A chill slowly crawls up her spine as she thinks about the forthcoming winter. She reaches for her favorite mug and pours herself a cup of hot steamy coffee. She sits at her kitchen table with her steaming mug in hand. It’s the silence of the morning that captures her soul. She loves watching the world come alive in her back yard as the birds, squirrels and rabbits gather their food for the day. She unwittingly stares out her windows to view the hustle and bustle taking place in the back yard. It’s another beautiful day in Tennessee. Winter will soon be upon us and she must get her gardens ready for the forthcoming season. As she takes another sip of her hot coffee, her thoughts subconsciously return to her childhood days. In her mind’s eye she is able to return to her childhood and all the wonderful time spent in her Papa’s garden. She may have only been six or seven years old, but Papa’s garden was magical. In the heart of the garden was a pear tree in all it’s glory. It stood in the center as if it were a castle watching over it’s realm. Her mouth waters just thinking about the sweet tasty pears that she picked to eat, off of that old tree. She can still feel the soft dirt upon her bare feet as she ran through Papa’s garden, while playing with her cousins. Nothing is more precious than a child’s imagination and theirs ran wild in that garden. There were dragons to slay upon the vegetables and there were damsels in distress under the fig trees. The plum, crab apple, apple and peach trees became markets to gather for meals that were made into pretend pies and dinners within houses made of hay. Alice’s wonderland had nothing compared to her Papa’s garden. Her thoughts return to the present as she takes another sip of her hot coffee. Oh how she wishes she could bring the magic of Papa’s garden to her garden. The magic is long gone, but still lives deep within her heart and soul. If only she could share that magic with the world! The world will never know the magic created by her Italian Grandfather, or will it? Deep within our hearts and somewhere in our memories we all have locked away the magic we possessed as children. Many of us store it away to revisit on another day, while others lock it away never to be seen or felt ever again. Donna captures the magic created by her Grandfather in her new song “Papa’s Garden.” This simple, easy and gentle song takes the listener on a journey of how a seed planted in a child’s heart can emerge into a tree as an adult. 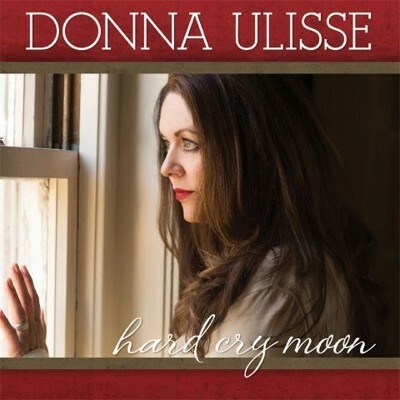 On September 25th, Donna Ulisse released her new album Hard Cry Moon. The album features a delightful array of twelve magical songs. “Papa’s Garden” is the first of many songs taken from this outstanding album to hit our list of Top Songs of 2015, while earning a nomination for the Spirit Award’s Song of The Year Award. Donna captures the heart and soul of her maternal Grandfather, Lloyd Butler, in her song “Workin’ On The C & O.” It’s the whimsical chorus in this song that captures the listener’s attention. “Brace yourself, it’s a true story.” explains Donna. “My mother-in-law has had some amazing experiences. She’s fought some real tigers in this world. She’s eighty-four years old and stays up in that little mountain cabin by herself. She’s just this really strong woman that I would love to have any part of her be part of me because she just knows how to survive and she’s just a crackerjack. She has this little sister that lives around the bend from her. It’s sort of parallel from her mountain cabin, but there’s this big mountain in between. She goes up there and sits with her little older sister and they snap beans and do all those beautiful things. I’ve seen them do it a million times. Donna captures a touch of her niece, who recently got married, in “We’re Gonna Find A Preacher.” Performed as a duet in a classic bluegrass feel with a beautiful fiddle accent, this song speaks about a couple in love who want to marry, however, their families do not give their blessings to the union. This is the second song on this incredible album to hit our list of Top Songs of 2015. One of the most entertaining songs on the album is also classified as the debut single release from it. “It Could Have Been The Mandolin” is performed as a classic country ditty. This song is another that will hit our list of Top Songs of 2015 as it reminds us that we generally fall in love while listening to a particular song that touches our soul. Donna released a very mischievous video to this song and can be viewed on our website. Donna slows it down with the title cut. Based on a story of a friend of hers, this honest ballad speaks about the difficulties of dealing with a break up and a broken heart. The final song to hit our list of Top Songs of 2015 from this album is a beautiful ballad called “As Long As We’re Together.” Written by Donna and her husband Rick Stanley, this song will also be added to our list of songs perfect for any wedding as it captures the truth about being married to the love of your life. “As long as we’re together...” adds Rick Stanley. The album also includes “Ain’t That A Pity,” “I’m In For A Long Ride,” and “Whispering Pines.” The album opens with “Black Train,” a song in which Donna ingeniously uses a train as an euphemism to that of someone walking away from a bad relationship. The album closes with “I’ll Sleep In Peace At Night.” Performed as a soft lullaby, Donna could not end this extraordinary album in a more effective and perfect way. There is no ‘messing up’ when it comes to this album. It was so hard to choose which songs, from this list, to include in our list of Top Songs of 2015. Each of the songs are beautiful and graceful in how Donna is able to capture the characters, the elements and the lifeblood that makes her who she is today. It’s because of that reason we have to pull the entire album and nominate it for the Spirit Award’s Album of The Year Award. There is no argument that this is the best album to come out of the Bluegrass and Country Music genres in 2015! My only complaint is the title - for I believe that it should have been given the name of The Magic of Family. Her heart warms at the memory of those magical childhood days running through Papa’s garden. Her cup is now dry and she must start her day. She gets up from the table and heads to the sink to rinse her mug out. She is startled by the touch of her husband as he walked up behind her to embrace her with a loving and warm hug. It was a seed of magic that her Papa planted deep inside her so many years ago and it’s the seed of love that her husband has watered deep inside her heart. But when you break it all down, it’s the magic of family that makes her world go around. Click on image to purchase album.